This is going to be a boring blog post. I'm just warning you now. Unless you're seriously considering purchasing this product from TJ's but you're on the fence for some reason, you should probably just move along and read something more entertaining like Russ's most recent post, The Unofficial Foodie-Hack Blogger Credo, my old review of TJ's Chicken Pot Pie, or this heart-felt love letter. This post has nothing profound to offer, and since I've already used the line "No, kittah, this is mah pot pie" in a different review, there will be nothing even remotely funny or interesting for the rest of this article. Why am I doing this, you ask? Why am I being so down on myself? Because I just ate this whole package of miniature pot pies without Sonia tasting even one. While she was on her way home after a hard day's work, I heated these babies up and devoured the entire package myself. And they weren't even that good. This is my public penance for a terrible sin of gluttony. I could try to justify it by telling you that I was purposely sheltering her from a not-particularly-good TJ's product, but that's not really the truth. The truth is that I was just so hungry that I would have eaten a shoe and not saved anything for anybody else. So I figure a good way to punish me for my crime of selfishness is to boycott this blog post entirely. Please don't read it. And if by some chance you're still with me, please go ahead and leave me a derogatory comment below. Something that will make me feel remorse for my insatiable appetite and thoughtless action. Plus, I don't want any of you to see this picture of the product after baking. I'm pretty sure I did something wrong. This is a sad pic of pot pies. They look awful. And they didn't taste much better. It's almost as if all of the liquid and softness baked right out of each pie and only a crispy little shell was left. A greasy, buttery, empty little shell. I thought I followed the baking instructions. 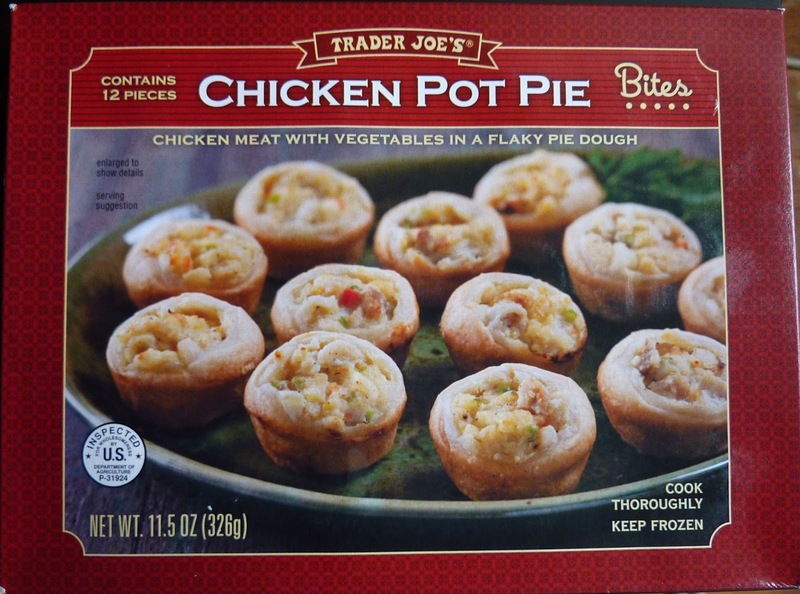 I thought they'd at least resemble the pot pies in the packaging picture. Not so much. There were just weird little pieces of chicken clinging to a dry, empty shell made of fattening breadiness. Those were my pot pies. And I know some of you are going to tell me that I should have left space between them when I cooked them. I did, I swear! But it looks like they melted while they cooked. How was I supposed to know the pot pies would melt rather than bake? About the only really good thing I can say is that the pieces of chicken were small enough that they weren't nearly as rubbery as the chicken pieces in the aforementioned TJ's original Chicken Pot Pie. And as I said before, Sonia wasn't around to taste this abomination, but if she had been, she would have given this product 2.5 stars. That's what I give them, too. Bottom line: 5 out of 10 stars. Looks like you created some chicken pot pie cookies there - the newest food mash-up. Eureka! Yes! 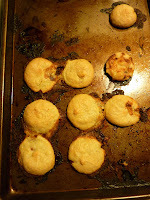 Chicken Pot Pie Cookies! ...and that's exactly what I MEANT to do! TJ's has some apps that are intended to bake right in the plastic tray. Yes. Crazy. But they don't cook right otherwise. If I remember correctly, these are in one of those trays. Yep... Nathan, I made the same mistake with these. Just looked at the instructions long enough to see baking time and temp, never imagining there was anything more to it than popping them onto a cookie sheet. They came out just as you described. Edible, but only because I was hungry and this was dinner. Only after choking them down did I see the instructions about baking them in the plastic tray. I think I will give them another chance and do it right this time. Yeah, I guess they do deserve a second chance in light of the fact that I didn't follow the instructions...let us know how they turn out when baked in the plastic tray. Hi Nathan~ I finally gave them another shot, done right this time and am glad to report they were much improved with proper baking technique--tender, flaky pastry, savory chicken-y stuff inside... definitely tasty. However, the thing that would keep these out of regular rotation for me is the time they take to bake. 50 minutes?! :) Good to know, Justine. Yes, I agree 50 minutes is a pretty big time investment for what's basically a plate of appetizers. I agree that a "re-do" would be called for, as I'm sure the texture and all will be quite different. Regarding baking in plastic, not all plastics are alike and many are basically inert at baking temperatures. I'm pretty sure that no degradable plastic that could emit harmful substances would be approved for such uses. Yes...yes. Harmful chemicals. That's *exactly* why I didn't use the plastic tray. But seriously, the mini muffin metal pan is an excellent idea. I made these in the included tray a few months ago. They looked pretty in the pan, but when I attempted to remove them for consumption, the bottom portion of almost every pot pie (and most of the innards) were left stuck in the tray. I didn't eat them but the hubby found them soggy and rubbery. Maybe the metal muffin pan would have worked better as it would help the bottom of the pies heat at a higher temperature. Either way, definite fail for us! Don't think we'll be trying them again. Btw...thank you for your blog. I read you ALL of the time. You are informative as well as seriously entertaining! This particular addition had me laughing out loud!! You're quite welcome for the blog! Thanks for reading, and thanks for the kind words. The info about cooking the pot pies in the pan/tray thing is helpful, too! I have made these a few times in the tray and are quite good actually. I never haD THE problem of them sticking in the tray. What I did not like however is the 50 min cook time. Quite a long time when you are hungry. Give em another shot. I told you not to read the blog post, Lina.